Real Feelings is Evan Gruzis’ second solo exhibition at The Green Gallery. As eluded to by the title, Real Feelings challenges the emotional subjectivity of viewership. This body of work addresses tense artist-collector relations, materialist concerns in still-life, and the theater of art installation norms. Gruzis also has created the first artist-designed “psychoactive collage” that, when ingested, takes direct effect on the viewers’ subjective awareness. For the duration of the exhibition, the exterior windows of the gallery will be covered in translucent perforated vinyl. Each section of vinyl will represent a “step” of the Wong-Baker Pain Assessment Scale scale, a common graphic used in medical offices around the world to quantify the intensity of physical pain. The English cardinal numbers originally appearing on the scale have been replaced by ancient Greek numerals, encouraging the viewer to link the comical Wong-Baker Faces to the famous masks of Comedy and Tragedy. Instead of the classic binary expression, the multiple faces imply a range and complexity of emotional responses, demarcated by the architecture of the gallery itself. This mixture of tropes establishes the theme that our reaction to art might be analyzed in some form of aesthetic quanta, just as numbers can be assigned to our pain responses. Gruzis has collaborated with video artist Martin Murphy to create Angry Collector, a short vignette that combines an actual voicemail from an unhappy art collector with found footage from the series The Bachelorette. While the voice recording – bleeped for anonymity – berates the artist about a drawing being “smaller” than another, we are met with video of “the bachelors” enduring the anxiety and ultimate heartbreak of the “rose ceremony”. In an atypical and revealing move, Gruzis aestheticizes artist-collector interactions. Power relations are brought out into the open, and real content is passed through the cultural filter of the staged “reality” series. With Murphy’s deft editing, a new emotional arc is established for the viewer. Ultimately this piece embraces humor by pointing to the absurdity of the scale/value relationship in the “contest” of art, where the approval of a few is sought by many. On the main wall, Gruzis will exhibit eight new ink paintings. Combining equal parts traditional still-life and commercial product styling, the works represent ordinary objects in a glowing liminal space, defined by high-contrast ink washes. While at first blush the most straightforward in the exhibition, these paintings strive for lofty conceptual real estate. 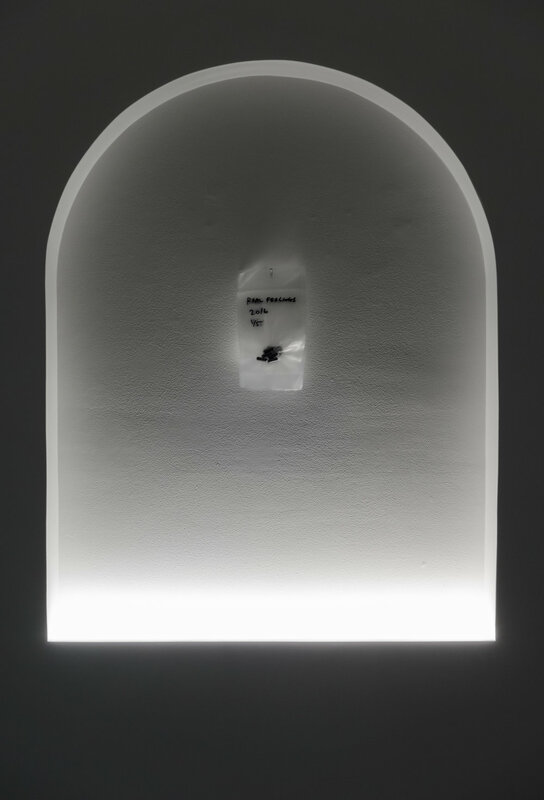 Each titled The Hard Problem / Value Tautology, they are partly inspired by critic/historian Isabelle Graw’s recent writings in which she describes paintings operating as quasi-persons, objects that establish value through the labor of the indexical mark of the creator¹. The “Hard Problem” portion of the title refers to the so-called hard-problem of consciousness², the idea that while we can explain the basic functioning of consciousness from a materialist perspective, physical processes cannot totally account for how phenomenological characteristics, such as tastes and colors, are assigned to experiences. With these works, Gruzis asks the question: If paintings can function as non-conscious quasi-persons, can the alchemy of value be equated to the similarly mysterious arising of qualia in the realm of consciousness? Gruzis is toeing a thin conceptual line by representing only containers – shells, plastic cups, generic vases, and nail polish bottles – quotidian objects whose images redouble the notion that the works are self-conscious repositories for value. To underscore this, the works are installed higher on the wall so that their “horizon” corresponds to the generally accepted mid-point of the viewers’ gaze, subjecting the works’ images (instead of their objects) to the rule-system of presentation and encouraging alternate readings. Gruzis’ use of installation becomes theater with Time Isn’t Passing… Y– (Corona Borealis), an unpainted stretched linen adorned with an array of seashells. Projected over its surface is an image in golden light of the silhouette of a window, evoking the wanderings of the late afternoon sun. Alongside the stretched linen is a digital print on aluminum that simulates an out-of-focus wall label. The total result is a representation of a situation where the “painting” exists in relation to environment and supposed contextual information. The key to this work lies in the arrangement of the seashells. Though seemingly random, they actually depict a star chart of the constellation Corona Borealis, which in Greek mythology represents the crown given to Ariadne by Dionysus, the god most closely associated with theater. Gruzis’ installation correlates humans’ tendency for myth creation based on pareidolia in the natural world to the derivation of meaning from art consumed within standardized infrastructures, making us wonder if we have entrained ourselves to ascribe meaning only in relation to norms and patterns of presentation. The blurry label and impression of low sun lament time’s erosion on all creative efforts. In the back room of the gallery Gruzis will present three more paintings, marrying tie-dye and oil painting in the Non-Intellectual Painting for a Lobby, Office, or Boardroom series. These abstractions blend the “non-intellectual” handicraft of fabric dyeing with saturated representations of data as simple chart and graph forms. Here ambiguous data is made explicit, tracked, and turned into default-color geometric abstraction whose generic quality could safely decorate the “head office”, while simultaneously creating a metaphor for the corporatization of counter culture that defines western media. Finally, the title piece for the exhibition, Real Feelings, will join these paintings in a custom-built niche in the “body” of the gallery. This work disposes of subjective experience in favor of actual molecular agency over the viewers’ awareness by way of its psychoactivity. Real Feelings is a collage of materials meant to induce a euphoric experience in its consumer and is comprised of a B vitamin complex, amino acids that induce a sense of calm and well-being, a potent chocolate extract stimulant, and an extract of Mitragyna Speciosa, a plant from Southeast Asia known for its opiate-like qualities. Here Gruzis removes the artist and the art almost entirely from the equation – to experience the piece the “viewer” must consume, metabolize, and therefore destroy the object. The certainty of its effect stands in contrast to the post-modern relativity of images, as well as the suspension of disbelief we entrust to certain artists whose “shamanic” practices we only experience through spectacle, prop or documentation. Perhaps our real-time physiology is – or should be – more accountable in tallying the aesthetic quanta we use to summate the art experience, and can be measured not only by color, material and form, but also in milligrams, neurotransmitters, and socio-architectural power relations. In the end, Gruzis proves that the emotional subjectivity of viewership persists whatever satirical, contemplative, or chemical intervention it encounters. ¹ See: “The Value of Painting: Notes on Unspecificity Indexicality, and Highly-Valuable Quasi Persons” by Isabelle Graw in Thinking through Painting, Reflexivity and Agency Beyond the Canvas, Sternberg Press, 2012. Graw further refines these notions of painting’s value production, largely supplanting the concept of the quasi-person with the idea of “liveliness” or “livedness”, in “The Value of Liveliness: Painting as an Index of Agency in the New Economy” in Painting beyond Itself, The Medium in the Post-medium Condition, Sternberg Press, 2016. ² See: Chalmers, David (1995). "Facing up to the problem of consciousness". Journal of Consciousness Studies. It should be noted that the “hard problem”, while philosophically intriguing, is not universally accepted to exist. Deflationary theorists posit that qualia will eventually be explained through better understanding of the physical processes of consciousness.